Want a super easy way to get your greens and whole grains in? This spinach-lemon pasta comes together so quickly, yet is an elegant way to enjoy healthy spinach, almonds, and whole wheat pasta. I really like the Barilla Plus pasta, which not only includes whole grains, but also 17g of protein per serving. And it’s delicious! I have made this vegetarian recipe for years and it even makes my carnivorous mother happy. 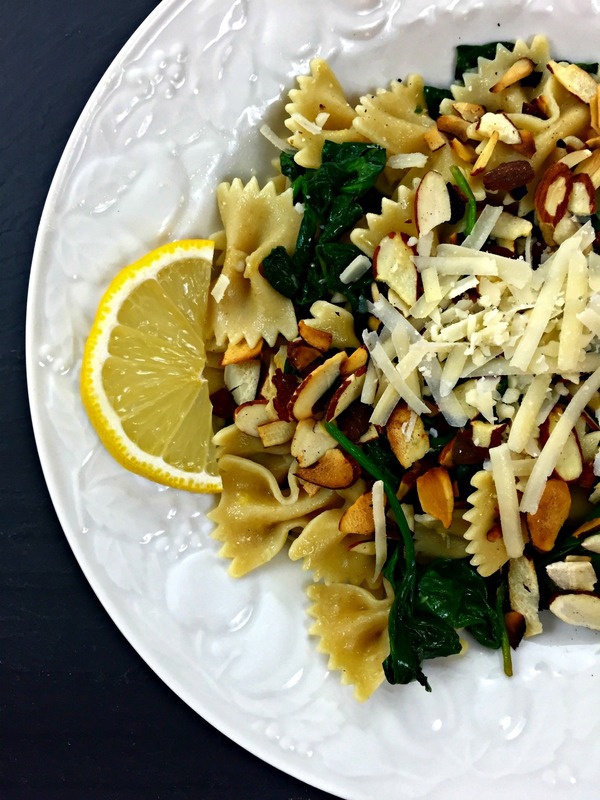 This recipe is adapted from The Joy of Healthy Pasta, by Joe Famularo. Years ago I went to a cooking class of his! My cookbook is autographed and everything. Equipment: Pasta pot, large saute pan. Bring large pot of salted water to a boil, to cook your pasta. In a small bowl, stir together the lemon juice, lemon zest, and pinch of sugar (that's to keep it from being too tart). Meanwhile, heat large skillet. Add olive oil, and when it's hot, add the garlic. Cook and stir until fragrant, about 30 seconds (do not wait for it to brown; if you do, it will burn before the spinach is done). Start adding the spinach to the skillet, a handful at a time, stirring to wilt the leaves and incorporate the garlicy oil. Keep adding spinach when more will fit, until all the greens have been incorporated, but the leaves still have a little bit of body to them (not completely wilted). You'll be astonished at how much smaller the volume of the spinach becomes! Remove from the heat, and stir in the lemon juice and zest mixture. Add sea salt & ground pepper to taste. Once your pasta is cooked, drain it, keeping it in its cooking pot. Over high heat, add the spinach mixture to the pasta, and toss to incorporate the sauce and pasta, about 1 minute. Taste for salt & pepper and adjust if needed. 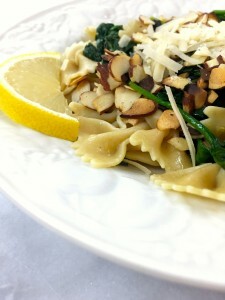 To serve, spoon into shallow bowls and top with toasted almonds as well as grated Parmesan if desired. Enjoy! !